Minimally invasive dentistry is an approach developed in the 1980's which is based on the preservation of a patient's tooth structure during dental treatment. Minimally invasive dentistry treats dental disease without sacrificing healthy tissue and avoiding the apparition of new pathologies. This favours the development of increasingly less traumatic techniques with the consequent diminution of patient’s anxiety. This fully preventive approach attacks carious lesions in the early stages to prevent them from growing and eventually requiring more invasive treatments. Children can be the first beneficiaries of these techniques as long as they are accompanied by good oral hygiene and proper nutrition led by their parents. Nonetheless, decay is not the only oral disease caused by the accumulation and putrefaction of food. Also periodontal disease, which is the most common cause of tooth loss, has food buildup at gum level, whether calcified or not, among its causes. Tooth decay is produced by demineralization of the dental surface thanks to a decrease of the oral PH. This pH decreases due to bacterial degradation of foods and sugars not eliminated by an adequate oral hygiene. Putrefaction, conducted by bacteria, releases enzymes which degrade the teeth tissues. Periodontitis, on the other hand, is an infectious inflammation of the gums that destroy the tissues that hold the teeth: bone and periodontal ligament. Regarding the nutritional prevention it is essential to have a balanced diet and avoid sugary foods or beverages. 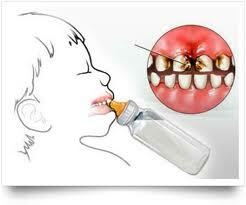 For babies or children it is important not to add sugar to the baby bottle or sweeten the pacifier. Even if the child does not have teeth, is advisable to clean their mouth with gauze soaked in water after each meal and brush after taking medication (because unfortunately they often have sugar to improve the taste). 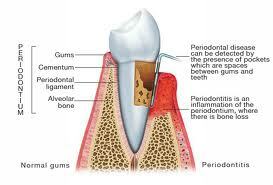 With dental prophylaxis, it is important to keep regular visits to your dentist and hygienist. The use of fluoridated toothpaste at home or fluoride in the dental practice, the use of xylitol chewing gum instead of sugar and the placement of pit and fissure sealants in children. Finally, when teeth surfaces needs treatment, more and more devices are being implemented to perform minimally invasive restorations. For the detection of incipient caries now dentists can rely not only in their professionally educated senses or in the X-rays (where small cavities are sometimes difficult to detect) but on loupes or machines that give an audible and visual cue of the extension and depth of the decays. Among them you can find: Diagnodent (Kavo), CarieScan or Sopracare (Acteon) a fluorescent light camera that detects caries spots and periodontal inflammation points. Also Proface (W&H) is useful at the end of treatment to check if some caries is left in the tooth while acts as transillumination light. Microabrasion (non cavitated lesions): uses aluminum oxide microparticles mixed with pressurized air to abrade the decayed surface. 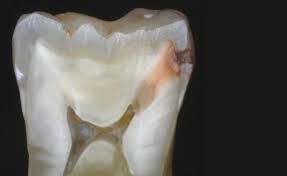 Afterwards, the clean cavity is restored with composites or better yet, glass ionomer cement that releases fluor. Aqua abrasion: uses water and air to abrade the tooth surface based on the same concept of microabrasion but with the advantage that confines the abrasive powder within the oral cavity, avoiding mess associated with traditional air abrasion and avoids the risk of surface cracking caused by turbines. Aquacut (Velopex) is one of the products in the market. 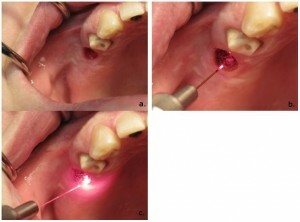 Laser technology: is a bright light that concentrates at a point and selectively removes caries by vaporization of the less mineralized tissue, when is used in adequate irradiation times and pulse frequencies. 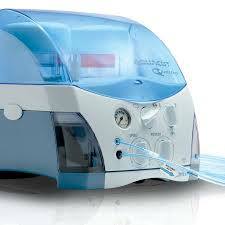 Soft or therapeutic laser used to achieve anti- inflammatory, anti-edematous, analgesic effect. Hard or surgical laser, used in surgical procedures as substitute of cold scalpel or in operative dentistry, to treat decay. For teeth, the laser is very effective in the removal of caries, not so in the removal of composite or amalgam fillings or in special preparations for veneers or crowns. Also is not recommended in deep cavities because can reach easily the nerve. - The postoperative period is less painful and healing times are reduced. Dr Cadorin graduated from the Complutense University, Madrid, in July 2007, where she then taught“Complex Dental Therapy in the Department of Conservative Dentistry as a teaching assistant. Dr Cadorin joined the Brighton Implant Clinic team in 2013. For more information please feel to Contact Brighton Implant Clinic or Call us on 0800 111 6623 to Book your free initial consultation.